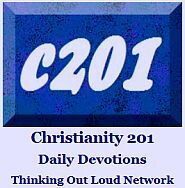 I remember years ago hearing people talk about recovering the towel and the basin as the symbol of Christianity; the idea was that the core concept of following Christ is to follow him as he washed his disciples’ feet. The discussion was still going on today here. Did you hear the story this week about the eight-year old boy sent home from school for drawing a picture of Jesus on the cross? 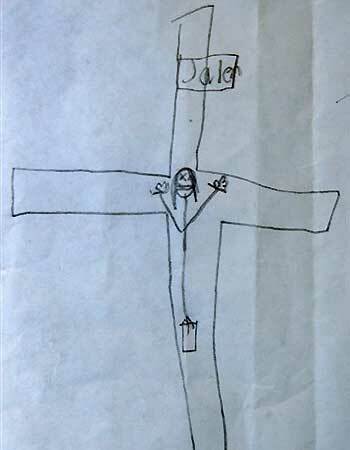 Asked to draw something that reminded him of Christmas, the boy drew a simple crucifix — pictured at right — with an ‘X’ in place of each eye to show that the person on the cross had died. The school sent him home citing concerns of violence and ordered a psychiatric evaluation. You can read the original Taunton Gazette Dec. 14 report here, and the latest update on the story here from Fox News. Sadly the Alltop blog aggregator is rapidly losing its usefulness when overtly commercial sites like Best Travel Deals are accepted. 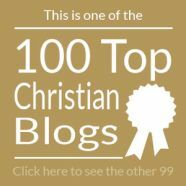 Currently however, if you’ve never checked out the site, you can scan the titles of the last five posts at top blogs in the Christianity, Church and Religion categories. 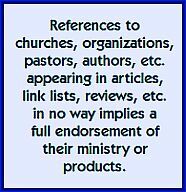 A few nights ago I ended up at a YouTube video containing the Casting Crowns song, Prayer for a Friend, when I was suddenly reminded of a CCM classic song by Debby Boone, Can You Reach My Friend? also on YouTube. While both are homemade vids, these are both great compositions. How much time do we spend crying out for friends — both current and long lost — who have not yet crossed the line of faith? HT – for the Taunton, Mass. student story to Tom Bauerle at WBEN radio in Buffalo, with additional links from David Mercier at the blog Redeem The Time.